2016 has been a rough year for me. I really didn't know how to respond. But, I recently read a book that helped me make sense of what I was observing. So, I'm gathering my friends and family around me by throwing a party tonight for LA-area friends. I need to get back to picking up clutter and cooking. 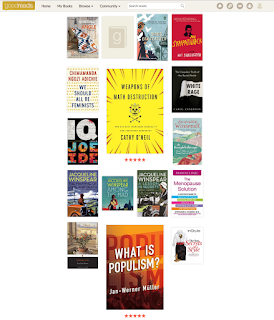 I'll quickly share my eclectic 2016 reading list on Goodreads. I read to learn; I read to connect to other humans; I read for entertainment; I listen to audiobooks to help me fall asleep. This is a short book and should have been readable in one evening had the last election not freaked me out so much. I had to put it down when too discomfited by PTSD from all the rhetoric that reminded me of living under Chang Kai Shek and martial law. Even my 6 yo self could recognize the lies in our textbooks. I never expected to live in a post-truth United States. Chapter 1 describes 'What is populism.' This is the scariest part for me, which brought up PTSD. Chapter 2 explains 'How populists rule.' This scares me. 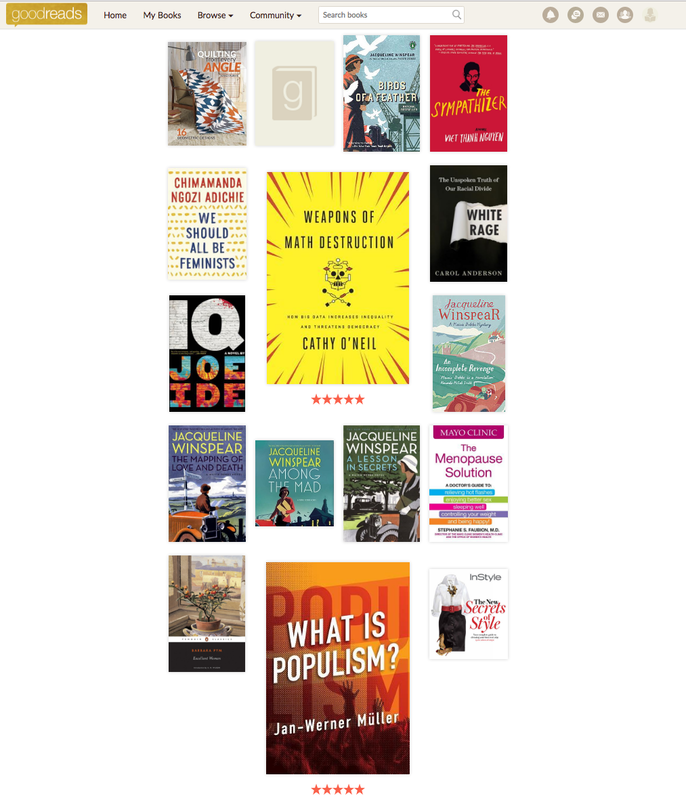 Chapter 3 gives some proscriptions for how to fight populists, from a scholar who has studied how populism waxes and wanes in regimes around the world. It gives me hope b/c some countries have defeated populists. But it is difficult as they change rules as soon as they are in charge to make it difficult. E.g. North Carolina voting changes and the Supreme Court that ruled that Lily Ledbetter couldn't file for discrimination because she didn't do so within 6 months of the wrong-doing, even while ruling her employers can withhold information and stall requests for info as long as they like. This is populism. It's a difficult book, because of the emotional stuff. The language may be difficult for people who aren't used to academic treatises. But this book is essential reading for our times. With the election of Donald Trump as the 45th President of the United States of America, What is Populism? is officially promoted from useful reading to essential reading. Jan-Werner Muller first defines populism both in terms of what it is and isn't - the defining feature of populism being a claim to represent a "real" citizenry that excludes elites and/or minorities. Another important feature is a derisive attitude towards the give and take of the political process and a rejection of the entire idea of political pluralism. Then comes the scary part of this monograph, where Muller describes how populists rule. Populists start by controlling and purging the government bureaucracy (note the Trump transition team's requests for names of DOE climate scientists and State Department personnel working on women's rights issues). After decrying the corruption of the previous regime, populists are incredibly tolerant of their own corruption and don't seem to care when this corruption is pointed out (sound familiar?). Finally, populists change the rules of government so that their party is difficult to remove and their policies are difficult to change (are events in North Carolina a sign of what is to come in Washington?). The third chapter is about how to talk to populists, and explains how those who want to protect political liberalism need to address the very real concerns that are causing populist movements to flourish. Many, including me, will feel that they are reading this chapter a bit late in the game. Muller's monograph is very well researched, and has numerous examples from populist movements of both left and right (including countries such as Venezuela, Bolivia, Hungary, Poland, Russia and Turkey). Although its tone is very academic, the intelligent layperson should have no problem with this book - unless it totally freaks him or her out. If you view his list of 2016 books read, you can see why I love him so and hate his housekeeping. I already explained my misgivings about Colorado Gives and the inefficiency of philanthropy. I found the Colorado Department of Revenue's Annual Report for 2015. Census.gov estimates that Colorado has 4.2 million adults 18 and over. This means about 1.5% of Coloradan adults gave something. Colorado taxes are a regressive disgrace. They manage to be even more regressive than the sad nationwide average. See how your state stacks up. To file part-year taxes for Colorado and California, I first calculate my taxes as if I solely resided in CA or CO. I would pay about 3% more of my gross income to live in CA over CO. But Californians enjoy more legal, environmental and economic protections as well as higher levels of service from government. If Colorado just followed California's example, we wouldn't have to resort to begging. During the presidential campaign, one candidate bragged that not paying taxes makes him smart, normalizes tax avoidance. Furthermore, he also gave virtually nothing to charities. This normalizes selfishness. He didn't just normalize it, he celebrated selfishness. Giving to charity is for chumps under the current system. Charities (thousand points of light) fills holes in the societal needs dike while states enable wholesale avoidance of responsibility to society with regressive tax codes and low tax rates. If you feel like giving, please donate to High Country News. I like to buy an e-subscription and donate a hard copy to a classroom.